← College Hockey Roundup: Where Have The Elites Gone? Editor’s Note: As we’ve reached the mid-way point for the overall hockey season, it’s time to select the mid-season All-America teams of each of the three major levels of hockey in the United States. If you’ll recall, at the beginning of the season, preseason All-America teams were named on United States of Hockey for the National Hockey League, NCAA and also a team featuring 2012 NHL Entry Draft-eligible players. Each team is made up of American-born players, with one player listed for each position, with a few honorable mentions for each as well. We kick off the mid-season teams with the 2012 Draft-eligibles today, with the NCAA team coming Jan. 24, and the NHL squad being unveiled Jan. 26. Looking back at the preseason list for the 2012 NHL Entry Draft eligibles, the mid-season list is going to have a few differences, as expected. In a given season, prospects will rise and fall throughout the year, so it was a pretty good bet this list would look different this time around. The end-of-season list could look a lot different from this one as well. In order to select this team, I took into consideration each player’s potential for a high selection in the NHL Draft, but also viewed what they’ve accomplished from a statistical output standpoint. Sometimes a player might have a very productive season, yet still find himself drafted in a lower position. Three players from the preseason All-America team have made it back onto the mid-season list, though each of the players from the pre-season have at least achieved honorable mention. Stefan Matteau was recently listed by NHL Central Scoutings as the 13th best skater in North America. It was a bit of a surprise ranking, as there hadn’t been a lot of chatter about Matteau as a potential top-half of the first round. However, the buzz is beginning to build as the big left winger with NHL bloodlines has vastly improved his game from last year to this year. A big reason for optimism is that proven growth Matteau has shown from one year to the next. He’s also found the offensive touch that eluded him in his Under-17 season at the National Team Development Program. He is currently tied for the U.S. National Under-18 Team point lead with 23 points, playing a schedule against USHL, NCAA and international competition. His solid frame and strength are giving scouts a lot to like. At 6-2, 210, Matteau has made himself difficult to play against and doesn’t shy away from the physical game. He’s racked up 110 PIM in just 30 games, some of which have come in the form of misconducts and majors. He might want to trim the penalties without losing his edge. As Matteau continues to round out his game, he should remain on a lot of watch lists. Kerdiles was initially listed on the preseason All-America squad as a left wing after spending time at the position at the World Under-18 Championship last April, but has migrated back to his natural position at center. The University of Wisconsin recruit was recently listed at No. 27 on NHL Central Scouting’s mid-term rankings and has been in the first-round conversation for much of this year. Kerdiles brings a pro frame at 6-2, 201, and some versatility. He’s good around the net, and shows nice finish, but he’s also proven he can be defensively responsible. Kerdiles knows how to use that 6-2 frame to protect the puck and create space for himself and his teammates. Having gotten a bit of a head start as an under-ager on last year’s gold-medal team at the World U18s, Kerdiles has maintained his consistent, steady game up front. He’s tied with Stefan Matteau for the U18 scoring lead with 23 points and tied for the team best with 12 goals this season. It’s often tough to put up a lot of points in the Under-18 season with the difficult schedule including many top Division I schools. Kerdiles has been able to come up with some big goals against some top college foes. It is likely preseason selection Alex Galchenyuk would have occupied this spot if healthy, as he continues to remain highly respected by scouts and could still end up as a top-10 pick in the 2012 Entry Draft. However, since he hasn’t played a regular-season game, Kerdiles gets a very deserving nod, as he’ll have a very good chance at being a first rounder come June. The right wing position isn’t incredibly deep with a lot of talent, and Samuelsson’s selection is based purely on the merit of him being the safest pick as far as NHL future among the Americans in this position. After spending the first half of the season with Modo in the Swedish Elite League, playing with pros, it became clear that Samuelsson was not ready to play with men. So he’s made the jump back to the junior ranks and has joined the Edmonton Oil Kings in the WHL. He’s made an immediate impact with a goal and an assist through his first three games in the WHL. It was probably not the best idea for Samuelsson to jump to the pros at 17, but it was more of a family decision as his father, Ulf, became Modo’s head coach. With a fresh start in the WHL, perhaps Samuelsson can resurrect his once promising draft hopes. It’s going to be an uphill battle to get back to his first-round projections of earlier in the season, but he has the size and skill level to meet that challenge. * – Samuelsson spent time with each of Modo’s professional, U20 and U18 squads. For the separated stats, click here. Of all the American prospects in the draft, Trouba might be the best (excluding Galchenyuk). He’s garnering a lot more top-10 attention and even earned the No. 4 ranking in International Scouting Service’s January list. 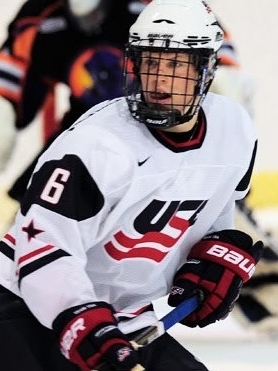 His maturing game has continued to wow scouts as he proved he could play with the world’s elite at the World Junior Championship. Trouba’s skating is what really stands out in addition to his strong physical presence. The areas that he needed to work on from last year to this year, he’s been working on and it shows. The main gripe of late is not seeing enough of his offensive game, but it’s an area I believe he’s better than he’s been graded by most. Trouba’s stock should only continue to go up, as he continues to solidify himself as one of the elite 1994-born players in the world. Though Jordan Schmaltz has been sliding down the draft rankings a bit over the last few months, he is still likely to remain in the first-round conversation for much of the second half. After engineering a trade to the Green Bay Gamblers, Schmaltz is on the USHL’s best team and is part of perhaps the best defensive corps in the league. Schmaltz has posted 21 points this season, currently tied with teammate and Anaheim prospect Andy Welinski for the league lead among defensemen. Points alone won’t get Schmaltz into the first round, however. There’s little question that Schmaltz is among the most skilled defensemen in the draft and will need to prove that he can be more of a force in his own zone as well. If he does that, particularly as part of what is expected to be a deep playoff run for Green Bay, he might be able to sneak back up the rankings a bit, but there’s a number of American defensemen that are nipping at Schmaltz’s heels. It was a really tough decision between Schmaltz and Brady Skjei for this second defenseman spot. Skjei has surpassed Schmaltz in nearly every ranking, but I gave the benefit of the doubt to the late 1993 birth year to make a strong push in the second half. It’s pretty hard to overlook what Gillies has done in the USHL this season, but it’s even harder to overlook this goaltender’s size. At 6-5, 210, Gillies is one of the largest goaltenders available in the 2012 Draft, and his play has matched his size. While carrying the load in net for Indiana this season, Gillies has amassed 18 wins, a 2.29 goals-against average and sparkling .927 save percentage. While he’s well protected with a good team in front of him, these numbers are more than solid when building a draft resume. It’s clear that Gillies has put a rather ugly performance (no thanks to a very weak D corps) at the Memorial of Ivan Hlinka U18 tournament in August behind him. The way he’s played so far in the USHL is making scouts forget about that tournament. That great size combined with statistical success in the tough USHL Eastern Division should allow Gillies to maintain a strong standing in what is a fairly weak North American goaltending class. That will do it for the mid-season United States of Hockey All-America Team featuring 2012 NHL Entry Draft-eligible players. Upon the conclusion of the 2011-12 season, we’ll do one more list of these players heading into the draft. Coming up Tuesday, the 2011-12 Mid-Season All-America Team — NCAA. Here’s what the preseason NCAA All-America team looked like. This entry was posted in All-America Teams, American Prospects, Junior Hockey, NCAA, NHL Draft, NTDP. Bookmark the permalink.